As Member of the European Parliament (MEP), as director of the European Office of the Rosa Luxemburg Foundation in Brussels, as coordinator of transatlantic and international projects and as an expert for social urban development she has been involved for over decades in the building of Europe. 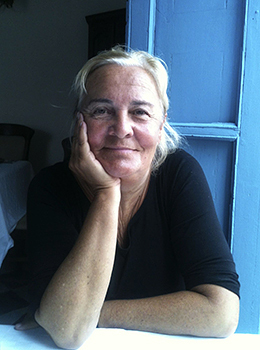 She ist the author and publisher of a number of books and articles on european and international issues. The common good of humanity, gender-oriented civil conflict prevention and the intercultural dialogue are in the focus of her present attention. Commons-movements are spread all over the world – and so they are in Europe: There is Barcelona with numerous initiatives like “Fearless Cities” and the recuperation of houses for homeless people; Referendums on water in Italy and in cities like Thessaloniki, Berlin and others reclaim water as common good; Community land trusts in Great Britain, Germany and other countries try to secure housing for citizens; urban gardening; occupied abandoned industrial plants and their re-organisation in alternative cultural spaces as “Officine Zero” in Rome; Workers’ recuperated companies (WRCs) and public health-care-initiatives trying to save living and working conditions under the threat of EU-austerity-regime in Greece; workers’ cooperatives (SCOPs) in France. The initiatives are acts of resistance against the still commodification and destruction of living-conditions and the continuous and even growing greed of reactionary politics and capital for privatisation of natural resources like water, speculation on real estate, housing and energy in cities, the regime of austerity policy by EU, privatisation of social risk and health systems and reduction of workers rights resp. growth of precarious labour as well as commodification of information, knowledge and culture. Looking at this picture of the growing Commons-movements in Europe it’s time to discuss strategies how to place them on European level: Commons as one dimension of initiatives to reclaim a social, ecological and democratic Europe. The specific demand is to implement commons as citizens’ basic rights. Well, it’s a long way to go … A first step would be making the idea visible as part of the public discourse of European Left. And then there are the upcoming European elections in 2019: specific demands for the acceptance of commons could be part of the election campaign.